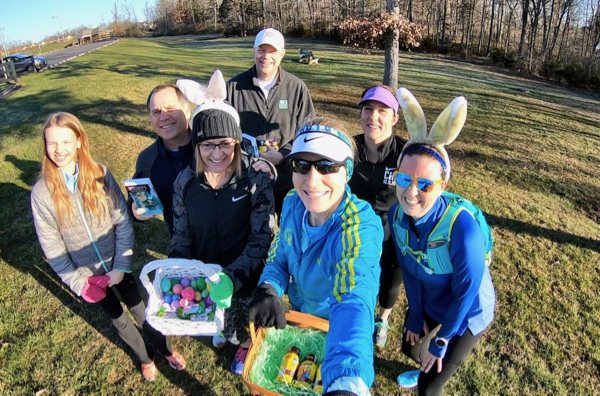 Yesterday morning was our ninth-annual Easter Bunny Hop. The tradition started when my Cruiser friend Jerome and I planned an excursion taking us off the W&OD Trail, winding along smaller neighborhood trails until we arrived at Bill’s and my back yard where we’d hidden bottles of Gatorade and plastic Easter eggs filled with packets of GU (affiliate link) and Sports Beans (affiliate link). Despite miserably heavy rain, the Cruisers loved the idea, and a tradition was born. Backing things up to earlier this week, I hit the hills for repeats on Tuesday, followed by an easy run on Thursday. Tuesday’s hill repeats went fine; however, just after 4.5 miles on Thursday’s run, my knee started bothering me… a lot. 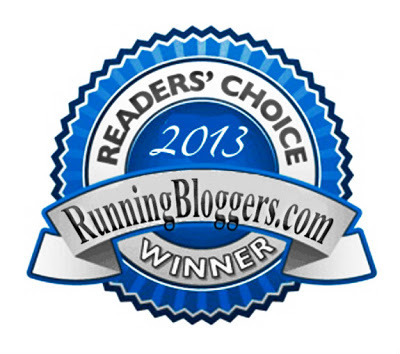 It was a completely new and unfamiliar pain, and as soon as I quit running the pain stopped. I’m closely monitoring it and hope it doesn’t cause problems on my hilly and technical trail race on Saturday. 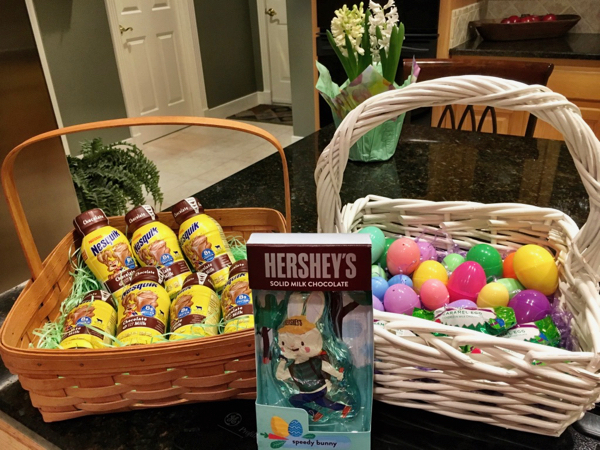 On Friday night I put together the Cruisers’ Easter baskets while waiting for our kids to get into town for the weekend. I also had two Speedy Bunnies to give out as random prizes. 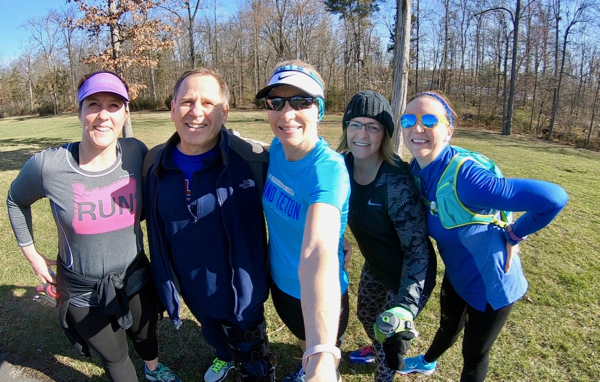 Saturday morning the Cruisers and I gathered at the W&OD Trail at 8 AM and took our obligatory pre-run GoPro (affiliate link) selfie. 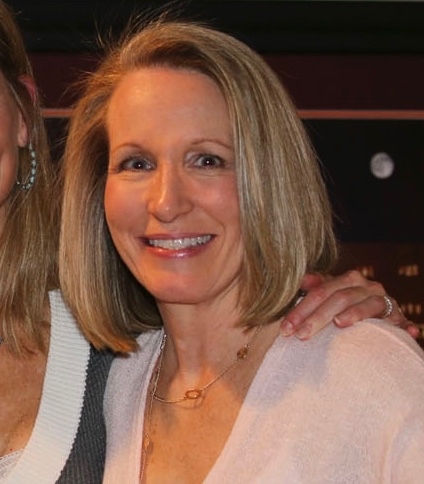 Since my dear friend Beth is moving to North Carolina in a couple of weeks, our Bunny Hop also served as a going away party for her. The previous week, I’d put together a special poster commemorating Beth’s many runs with the Cruisers. Cutting it close, I tracked it all week as it left Texas via UPS, arrived in North Carolina, crossed over Virginia in route to New Jersey, spent an extra day in New Jersey being transferred from UPS to USPS, and finally arrived at our house two hours after our Cruiser celebration ended. Not wanting to send Beth off empty handed, I presented her with… an empty frame. The girls and I had a delightful six-mile run. My knee started acting up again around mile four, but didn’t hurt badly enough to stop and walk. Chuck, who had ACL surgery a few weeks ago to repair an injury caused by a skiing accident, walked and finished up at about the same time as us. Joe and his daughter walked/ran, but were gone by the time we got back to the parking lot and missed the post-run picture. After our run, most of us headed to a nearby restaurant for breakfast and gave Beth an appropriate send-off. As I mentioned earlier, Beth’s poster arrived a couple of hours after I got home. Back at home, I spent a very relaxing afternoon and evening with my family. 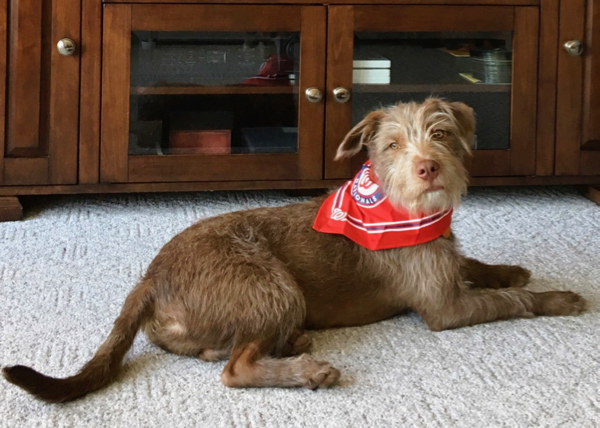 Pablo was as cute as ever and loved his Nats scarf the Easter Bunny brought him. I think he likes me because he followed me around, even conquering the scary stairs leading from the main level to the basement (he doesn’t have stairs in his house). The previous evening he had graduated from Level 1 Puppy School and was happy to show off his new tricks in exchange for treats. Happy Easter from Pablo and our entire family! Looking ahead to this coming week, on Wednesday please be sure to join me for my monthly Wednesday Word linkup where this month’s word is deliberate. If you run with a group, do you have any fun traditions that I should adopt for the Cruisers? That’s so nice that you put together that poster (even if it arrived late lol)! What a sweet group. We don’t really have any traditions other than our holiday party. Pablo is just adorable – I love the bunny ears on him. Hope that your knee is feeling better! 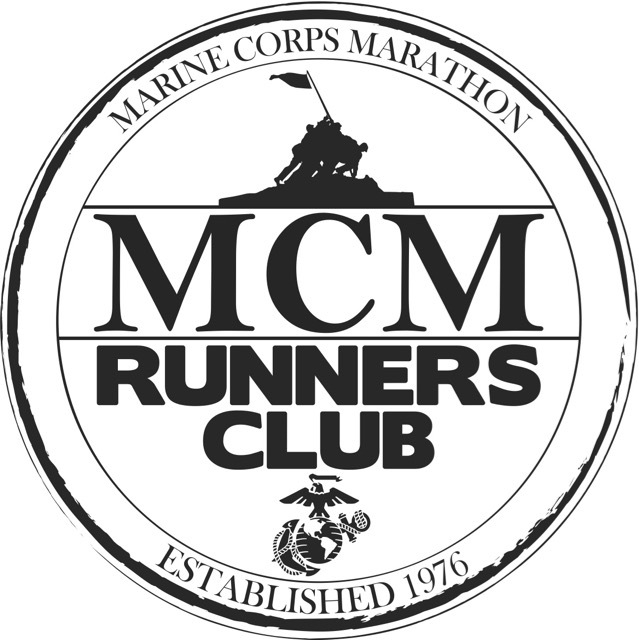 What a fun activity for your run group. I love things like that. I’d love to know how you made the poster. Such a great going away gift idea! Amy, I used Shutterfly and just picked one of their templates that I likes. It’s super easy! Oh how fun with the Easter Hop! I think that is a great idea! What a fun activity for your group! I love that it’s your 9th year doing it. I am solo right now as all my running friends are injured. Yikes. Oh no, that’s such a bummer with all those injuries. Hope your friends recover quickly! Oh, no. I hope your knee and my hip get it together ASAP. The poster is such a sweet idea for your friend. Too bad it arrived a little late but I’m sure she’ll adore it just the same. Pablo is adorable. 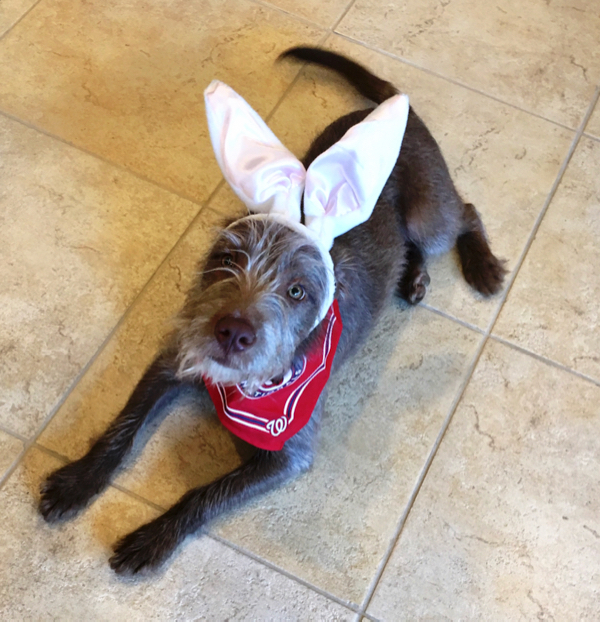 Now I’m wishing I’d put bunny ears on my dogs. 😉 Thanks for linking. I agree – our knee and hip need to quite complaining! What a fun tradition! I wish I had a group like that, but it’s usually just myself and my friend, Barb. Ugh to the knee! I hope it feels better for your race. Yes, I do! We’re both very lucky to have so many running friends! 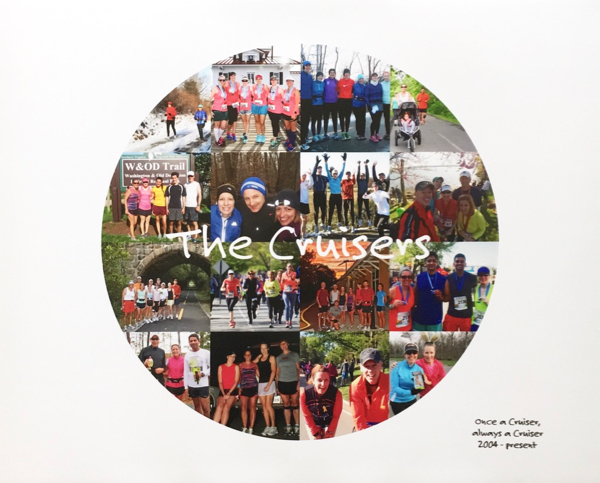 The Cruisers sound like a wonderful running group. 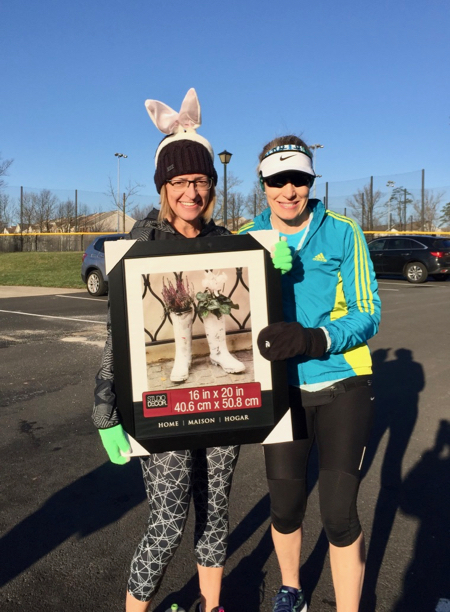 Running with friends makes the miles so much more enjoyable, and the poster was the perfect going away present! Hoping your knee is better soon! Yes, I agree, running with friends makes the miles fly by! Shenanigans – perfect word to describe the Cruisers fun!